Does this even need announcing any more? 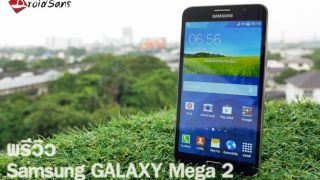 We were expecting Samsung to announce the Galaxy Mega 2 soon, possibly even at IFA 2014, but it hardly need bother now as the phone has already gone on sale in certain shops in Thailand and Malaysia. Thai website Droid Sans picked one up and spilled all the beans on what we can expect. The Galaxy Mega 2 has a 6.0-inch, 720 x 1280 Super AMOLED display, which size wise puts it between the two versions of the original Samsung Galaxy Mega, which came in 5.8-inch and 6.3-inch flavours. It's every bit as mid-range as its predecessor, with a 1.4GHz quad-core Exynos 4415 processor and 1.5GB of RAM. There's a 2800mAh battery and the Thai version comes with an 8MP camera, though apparently the upcoming Chinese version might get boosted to 13MP. The Mega 2 supports 4G and NFC, runs Android 4.4.4 KitKat and there's 16GB of built in storage along with a microSD card slot. The actual design of the Galaxy Mega 2 shares more in common with the Samsung Galaxy Note 3 than the original Galaxy Mega, as it has a faux-leather back. Droid Sans finishes by revealing that the handset sells for 14,500 Baht (around £280, $450, AU$485). As for when it will be available, that's still unknown, hopefully we'll find out when Samsung announces it, as pointless as that now seems. Samsung's also expected to launch the Galaxy Note 4 soon.